I deleted an old schedule and now I’m trying to make a new one. I’ve tried flex daily and monthly and several options are grayed out. Never had this issue before. Now that I’m looking into this more. ALL of my existing schedules are giving me the same options. @Desmo - My Fixed (specific days) and Flex Daily with no restricted days schedules have all options available. The Flex Daily schedule that has restricted days have the options shown above. I think it may do with the restriction days and Rachio building the schedule backwards into a restricted day. I have another Zone called “front slope” that I set up last week with all days selected and I chose “end before sunrise”. At the time I had all options a available. When I go there now. Those are all grayed out. @Desmo - may have been a change / “feature” introduced with the latest released version 3.8. @Franz, @laura.bauman is this new to 3.8?? Well if this is a new “feature” then someone needs to rethink this. I don’t want my lawn to start watering at 8pm which is technically “after sunset”. And I don’t want to have to figure out how to start each zone so they don’t over lap. What the hell is goin on?? Yes, we only support one “end by” schedule now (per controller). There were too many variables that weren’t allowing them to always function as intended (they get extremely difficult when spanning days and/or are stacked against each other, skips with weather intelligence ). The product team is working on explaining that better in the app. Sorry for the confusion. Wow. This is really lame. I had a perfectly functioning schedule for all my zones and now what do I do? I have to manually tell each zone when to start? How do I prevent overlapping runs? Using the “start after sunset” is NOT a good option. I’m Beyond frustrated with this change. @Desmo - Rachio will only run one schedule at a time. If multiple schedules have the same fixed start time, one will be started and then after it completely finishes the next schedule will start. I’d stagger the schedules by 10 - 15 minutes each just to give Rachio time to pause/delay the correct schedule if Flex or intelligence is turned on and multiple schedules will fire. How many schedules do you currently have? You can put everything into one schedule if you want, and have the system manage it. I’ve chosen to have 3 schedules. One is for some flowers that I have water at 8am in the morning. Another is for my drips, which I let start at 9:30am in the morning, since they can water during the day with no problem. Then for my grass, I put all the zones into one schedule. Once I did that, I looked at the duration for that schedule and said to myself that I wanted it to finish up by 7am or so — I took the total duration time, backed that up in my head, and set my lawn zones schedule to begin watering at 4:30am in the morning – only if they all water on the same day will they hit that 7am time. A little bit manual to figure out, but not difficult, and it works. I think it was 5 schedules for 7 zones. I put the 3 lawns on one, two drip lines on one, a xeriscape on one and another mix vegetation zone on manual. I set the first 3 schedules all to flex daily and “end before sunrise” (which was the recommended setting) and I let the computer figure it out, and it worked great. Im mostly frustrated that Racchio didn’t communicate this change was coming to customers via an email. Instead just one day when I decided to switch up some zones and update the schedules I discover that the options are gone. I understand your frustration with the lack of communication, and I apologize for that. Like Franz mentioned, this restriction was introduced to prevent irregular stacking behavior that could sometimes result in schedules not running at all. More information can be found here under number five, and the complete release notes for the 3.8 release (which is when this change was implemented) can be found here. We are planning on implementing better explanation of the grayed out options in the next release, but I agree the transition would have been easier if the two features were released together. This is something we will learn from and apply to future release planning. I think @Linn had a great recommendation- one perk of flex scheduling is that you can include different zones in the same schedule and they will still be watered dynamically. 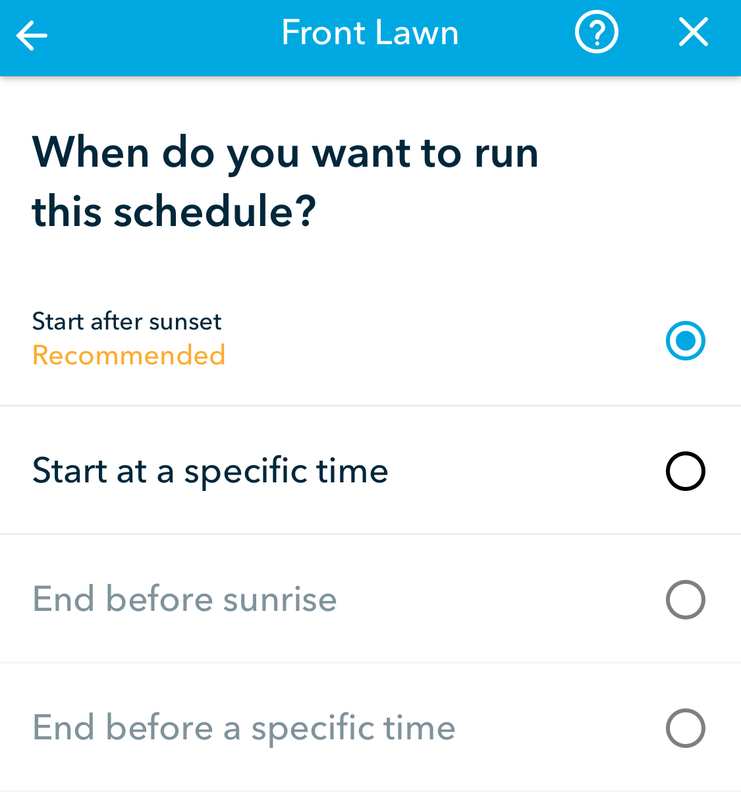 This may help consolidate the number of schedules you have and allow the “End before sunrise” feature to be applied to more of your zones without being applied to more than one schedule. @franz, So a question on this topic which I just noticed. I have five separate schedules, 4 flex monthly, 1 fixed. I have all of these set to “end by” 7 AM. All the schedules still show that way and I haven’t noticed any particular problems with them running. 1) I assume that this means that they are all still running correctly that way, true? 2) I also assume that if I have to recreate them I CANNOT recreate them that way, true? I assume that this means that they are all still running correctly that way, true? Correct. We have experienced an issue with stacking where a schedule would be set to not run due to weather intelligence, weather changes and there is no more room for the schedule so it got skipped. Limited edge case that only allowing one “end by” schedule will resolved. Most customers won’t experience this. I also assume that if I have to recreate them I CANNOT recreate them that way, true? Hi @franz - if this is a limited edge case, then why not leave it as it was and handle it with a log entry / push notification that says “Please Note: Weather changed overnight as of X:XXAM; however, the <schedule_name> duration exceeded the amount of time remaining before sunrise. The schedule was skipped as a result.” The user wakes up to this and has the option of kicking off a manual run that morning before it gets too hot. Your current method pretty much takes the automation out of the product. 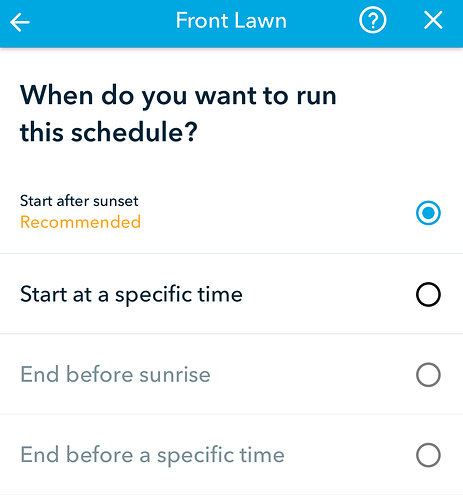 As another user mentioned, we don’t want schedules kicking off at sunset… not for grass anyway. @franz, thanks for the clarification. I’d like to do a +1 on CJ’s suggestion though. @franz while I understand the issue identified, it doesn’t seem like there was full consideration of the possible use cases. The current implementation is overly restrictive and does not account for scenarios that could not introduce the conflicts cited as the drivers for this change (2 daily flex schedules using odd/even intervals). I have outlined my configuration in multiple threads in this community. Similar to many other users, I was seeing my ‘end before sunrise’ schedules starting shortly after midnight to allow for the possibility that all zones would need to run in a given day. I was able to overcome this issue by creating two Flex Daily schedules, both configured for Even/Odd intervals, one on Odd and one on Even. This setup guarantees that the scheduling conflicts that have been identified as the drivers behind this new limitation can not occur. The start time for a given schedule is determined after all of the other relevant settings are identified (zones, days to water). 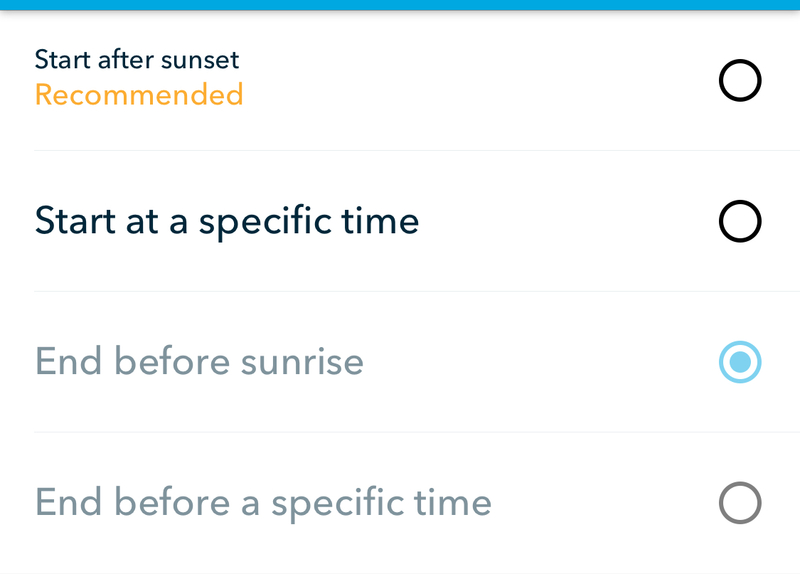 I believe the end before sunrise/specific time options should only be disabled if there is an existing schedule with overlapping days, not just a schedule that already has identified an end before sunrise/specific time. I had one schedule for grasses and one for plants, scheduled on even and odd days respectively, this model has worked very well for me this summer. Unfortunately, I tried to modify a schedule this morning, I wanted to change from end before sunrise to end before a specific time. As fall approaches we are getting up before sunrise and I would like the watering to complete before we begin taking showers. I couldn’t select either option, and stupidly selected a start by time to see if I could get the other options to enable. Now I have lost my schedule completely as I tried to recreate it in the app before I did any investigation in the community. Please consider revisiting the conditions for disabling these scheduling options, there are viable use cases that do not conflict with the original drivers of this change. @mitchell @mckynzee Feels like there might be some room to modify “end-by” constraints in certain situations. I’ll let the product team review and determine what the next steps are. @franz, @mitchell, @mckynzee - Has there been any more thought on the status of this restriction? What if we signed a waiver saying we understood there could possibly, once in a while, be a problem? There has been some progress on this. We will be releasing an update shortly that at least explains why the “End Before” options are greyed out after one is already created. This is in response to @Desmo’s comment (and others) that we absolutely could have communicated this change to users more effectively. 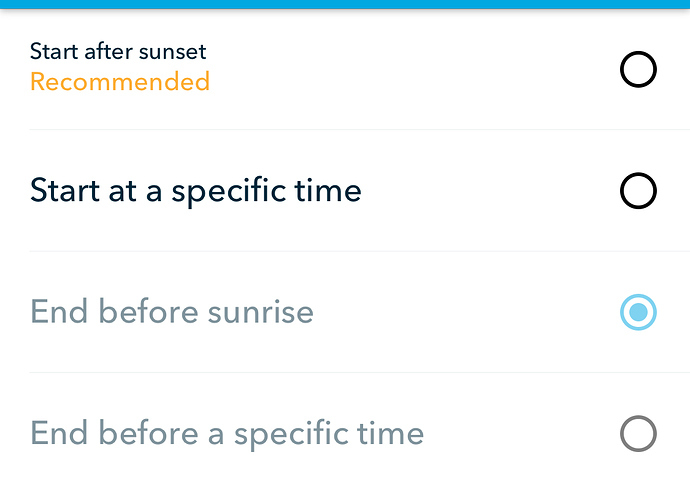 I do like the idea of opening the option up to people if their schedules run on different days, and some of the other recommendations on how to make the restriction more intelligent. These solutions are more complex from an implementation perspective. Out of curiosity, how many schedules do you have @davelr? Are they all scheduled to run on the same days, or different days?